The big question to ask yourself is: Can I look into the future and see myself continuing in this way? Living with a mental disorder like depression, stress, or addiction is a grim existence. A common time for us to desperately seek out help is after having suffered a nasty collapse of some sort. We are propelled out of that dismal low into a manic defense of rigorous over-compensation of positives. There’s no way on God’s Earth that we want to go back to living and feeling like that, and we are going to do everything in our power to make sure we don’t. I myself have a history of this recovery pattern. Of bouncing along rock-bottom for months, until some catastrophe of self-awareness happens, and then I am catalysed into gotta-do-everything-to-get-better. Extreme focus, extreme motivation, extreme discipline. I become the Recovery Poster Child, who receives the oohs, ahhs, and back-pats from therapists, doctors, and fellow support group members. It is trues that you won’t recover if you do the same things, in the same way, with the same people – as you did when your mental disorder was winning the battle for your soul. 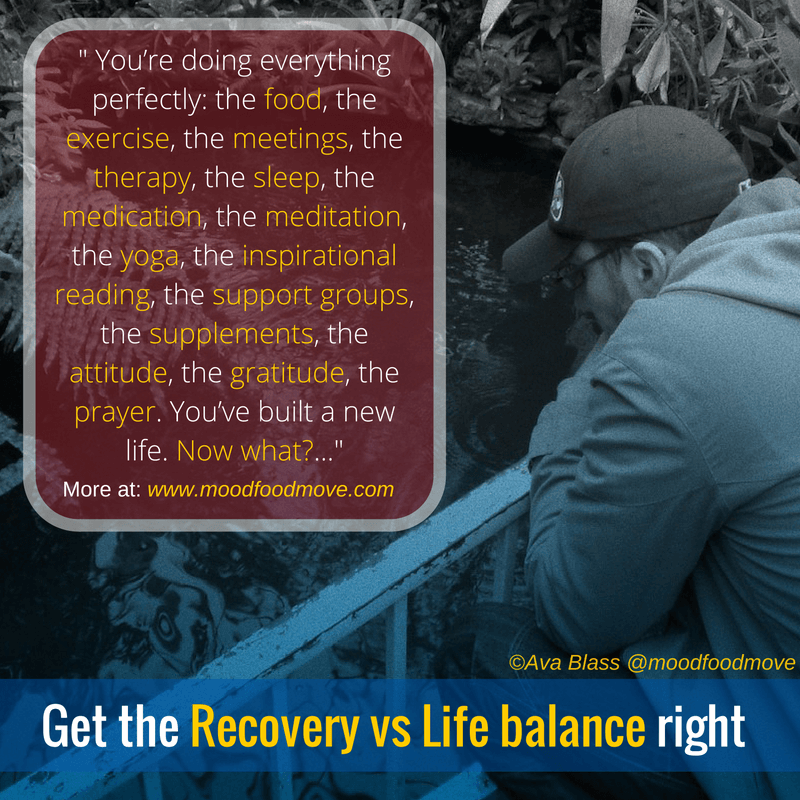 No, you can’t recover if you keep the same old lifestyle and habits. But equally you won’t recover if you tip too far the other way. It has to be sustainable. The answer we get to the above question “Can I look into the future, and see myself continuing like this?” has to be Yes. We are aiming for a balance where you can lightly manage your recovery, so that you have plenty of room to enjoy your happy healthy life. 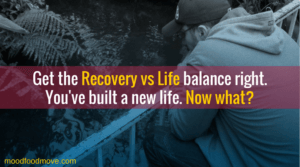 What we are trying to avoid is applying the same desperation to recovery, that we applied to the flailing mess of our depressed/addicted/stressed life. Swapping all-consuming misery for an equally all-consuming obsessive recovery is a problem if there is no room left for anything else (i.e. a life). 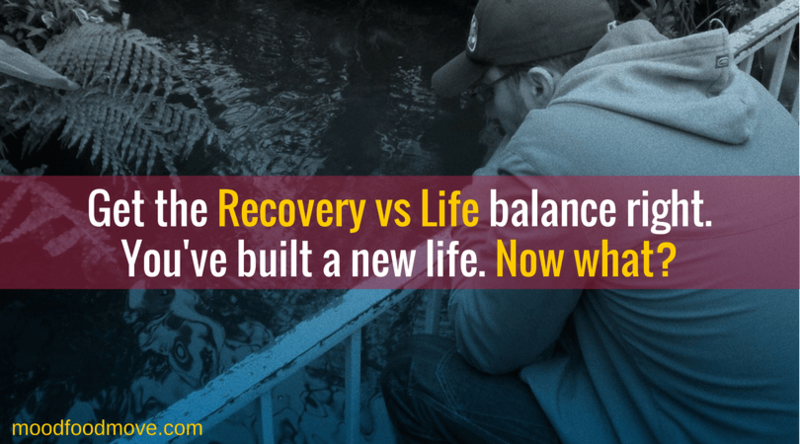 All of us will go through a learning curve in early recovery where all our time and focus has to be on recovery. We take it seriously. We swap the hours formerly spent boozing – or coiled in fetal position, crying – for meetings, appointments, and developing positive lifestyle habits like good food, exercise, meditation. We have to, and need to, and must, prioritise these things. The rest of our life has to fade into the background as our new life takes purchase. It’s a vulnerable time, and we need to give ourselves time to bed in our recovery life. There are many instances where channeling our all energies into a new healthy obsession bears very ripe fruit: running, vegan, yoga, meditation. These people have forged new identities as ultra-marathoner, vegan-athlete, yoga teacher etc, from the embers of junkie, booze-hound, depressive. They have shed the old skin, and assumed a new positive form of themselves. If that feels right for you, consider it carefully. Please be wary of something I myself have done this many times, until I found the middle-way. 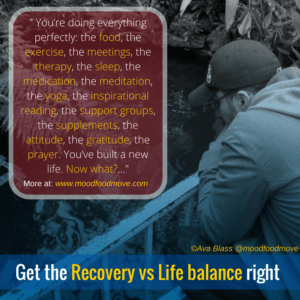 Be careful to not fill all your time with recovery-related activities – as a way to plug up the holes where addiction/depression/stress once got in. I’d become twitchy and anxious if I couldn’t go for a run, or I didn’t have my smoothie for breakfast, or something threatened to interfere with my meditation time, or reading time, or allotted meal time. This perfectionism was destructive, because it gave me no room for mistakes, for learning, or for accommodating change. Can you see what I am saying? Is swapping your destructive lifestyle for a gilded cage of obsessive-perfection really contributing to better mental health? It’s a different mental health issue. It’s akin to swapping a nasty junk food diet for the obsessively clean-eating misery of orthorexia. So, what is the answer? How do you get the balance right? The answer is to trust yourself. Allow yourself to find a happy medium with your routine. Trust yourself that you’ll find a routine that honors what you want to achieve. Ones you’ve mastered the ropes of what you need to be safe and healthy, loosen them enough to support you… but not enough that you fall through.